Did you buy, sell or refinance a home in 2018? Check out these potential homeowner deductions on your 2018 taxes and be sure to discuss with your tax accountant. Closing Disclosure Page 2, Section A – If the origination charges on Page 2, Section A of the Closing Disclosure include points paid to your mortgage company in exchange for a lower interest rate, you can deduct those points in the year paid… even if they are paid by the seller. Other fees in this section (application, underwriting, processing, etc.) are NOT tax deductible. Only bona fide points are deductible if they are expressed as a percentage of the loan amount and paid in exchange for a lower interest rate. · You can deduct over the life of the mortgage all points paid on the portion of the mortgage proceeds that were not used for home improvements (for example, if you refinance your mortgage to reduce your interest rate, but do not take any cash out for home improvements). · You can deduct this year all points paid on the portion of the mortgage proceeds that were used for home improvements (if you received cash-out and are using that cash-out for home improvements). Remember, any points paid on the portion of the mortgage NOT used for home improvements must be spread out over the life of the loan. For example, assume you refinance an old $200,000 mortgage into a new $300,000 mortgage and walk away with $100,000 to be used for home improvements. In this case, 1/3 of your points are fully deductible this year and 2/3rds of your points are deductible over the life of the loan. · As outlined above, other fees itemized in this section are NOT tax deductible. Closing Disclosure Page 2, Section F – Property taxes itemized in this section are generally tax deductible in the year they are paid. However, property tax escrows in section G are NOT tax deductible until they are actually paid by your mortgage company to the municipality (city, state, county). Closing Disclosure Page 2, Section F – Mortgage interest is calculated in arrears. This means that your monthly mortgage payment actually covers the month that just passed. For example, your February payment covers the interest for the month of January, your January payment covers the interest for the month of December, and so on. Oftentimes, when you refinance a mortgage or buy a new home, you “skip” a month’s worth of mortgage payments. That is why you sometimes pay “pre-paid interest” or “daily interest charges” in Section F of the Closing Disclosure. These daily interest charges cover the interest for the current month. 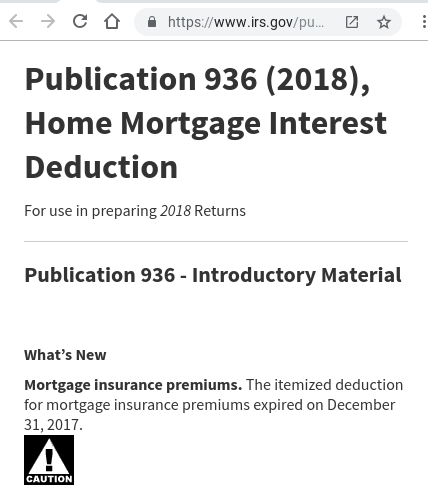 If your mortgage interest is deductible, then pre-paid interest that you pay in this section is also deductible (this will be included in the 1098 statement that you receive from your mortgage company). You may be able to deduct the remaining portion of the original points paid on an old mortgage if you refinanced that old mortgage in 2018. For example, assume you paid points on a refinance transaction 3 years ago. You probably were not able to deduct all the points you paid in the year they were paid. Instead, you had to spread that deduction out over the 30-year life of your mortgage. So, assume you’ve deducted 3/30ths of those points so far, and you refinanced your mortgage again in 2018. You can now deduct the remaining 27/30ths of those old points that you have not yet deducted. A pre-payment penalty paid on an old loan would be deductible on your 2018 tax returns as long as the new loan was taken out from a different lender than the old loan. Closing costs not mentioned above are not tax deductible. However, they are added to your “tax basis” for purpose of calculating your capital gain when you sell the property. In other words, you may be able to reduce your capital gains tax (if applicable) when you sell the property in the future because your home purchase closing costs get added to your cost basis.